The life of a Minor League Hockey player is one not comparable to many others. There is the constant travel, the not-knowing what city you are going to play in the next day with the constant chance of being called up to the NHL. They make about as much as any mid-level management position. However, the duration of their careers is not as long as someone at an easy-to-do desk job. But, the dream of the NHL drives these athletes towards their dedication on and off the ice. 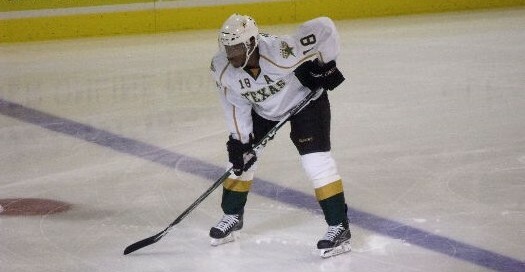 Athletes, like Texas Stars Assistant Captain Maxime Fortunus, live this dream every day when they wake up and head off to the hockey rink. Maxime’s parents both were born in Haiti, but moved to Canada in search of a better life. On July 28, 1983, Maxime was born, and began playing Ice Hockey on the frozen ponds in La Prairie, Quebec in Canada shortly there after. He started his quest for the NHL in the Quebec Junior Major Leagues, which have seen such NHL Superstars as Sidney Crosby, Major Lemieux, and Wayne Gretzky. Maxime was then sent off to start his life in the NHL Farm system, playing for the Eastern Coast Hockey League (ECHL) Louisiana Ice Gators. He spent his first two years bouncing between the Ice Gators, before moving up to the American Hockey League (AHL) with the Houston Aeros. After those two years, Maxime found a nice spot with the Manitoba Moose. Spending four seasons in Manitoba, Maxime thought that he would stay in their Farm System and make his way to the NHL. However, the hands of fate took him from the cold weather of Canada, back down to the warmth of Texas. This time around, Maxime found his way with the newly established, Texas Stars in Austin. Mid-way through this season, Maxime got his first call up to the NHL, playing with the Dallas Stars. The Austin Times: Why did your Parents move from Haiti up to Canada? Maxime Fortunus: They were following their cousins and other family. My mother and her sister moved up to Canada, and Quebec was a good place. They speak French in Haiti and they speak French up in Quebec too, so it was easy for them. There is a big Haiti community in Montreal as well. They were trying to make a better life for themselves. TAT: How did you get your start playing hockey? MF: (Laughs) You know, you will have to ask my mom. Once she got there she didn’t know a lot about hockey, she just thought it would be a good idea since we played soccer and there was hockey and it just kind of happened, as she thought it would be good for us. TAT: Now, life in the AHL, you started out in Lafayette, then to Houston, Manitoba, then finally Austin; which one is your favorite city? MF: I had two years in Lafayette and those were my first two years as a professional, so that was a big adjustment for me. And then, in Houston, I was only there for a couple of games at the end of the year my first two years. Then, Manitoba really gave me my first chance to play and grow in the league and I have a lot of friends back there. So Manitoba is one of the best organizations out there they really treat their players well. Then coming here to Austin, and then getting a chance to play in Dallas (the NHL Stars) has really worked out well for me. TAT: Who was the first person you called when you were brought up to the Dallas Stars? MF: My mom. She has been with me ever since I started playing hockey and she has always been there with me, so my mom and my brothers, they’re the three main people around for me. My mom is always there waiting for those calls from me, so I didn’t have to worry about no one being there once I got called up. TAT: Any pre-game rituals you like to do to help you get focused before a game? MF: Ah, no, I don’t like to get caught up in routines. You want to keep everything the same; you don’t want to get caught up in to many superstitions or anything like that. I just like to go around and think about my game, but there is not anything special that I have to do. So you know I don’t like to get caught up in those things as you’ll see guys who think they have a bad game just because they didn’t do something in their ritual. TAT: Any reason why you wear the number 18? MF: That was the number that they gave me when I first started out in Juniors (QMJL). But then I lost it for a couple of years, but when I came to Austin I was able to wear it again. Also, my son was born on the 18th. So it just kinda happened that it was my number. TAT: What is your prediction for the Playoffs? MF: We just have to take it game-by-game. That has been our mentality for the whole season. You have to keep on thinking that so that you don’t start to look ahead and lose focus on what’s in front of you. If you want to come out to see Maxime lead his teammates in the 2nd round of the AHL Playoffs, well you’re in luck, as the Stars are at home all this week. Game 3 of their best-of-seven series against the Chicago Wolves is Tuesday Night, with Game 4 on Wednesday. The potential series clinching game, Game 5, is on Friday Night. All games are played at the Cedar Park Event Center and all start at 7:30pm.